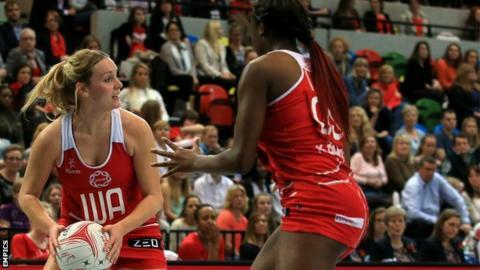 England beat Wales 69-32 to go top of the table in the Netball Europe Championship in Belfast. Tracey Neville's side followed up their convincing victory over Scotland on Friday with a dominant performance against the Welsh. They led 35-19 at half-time before stepping up the pace to easily outscore their opponents. England face Northern Ireland at 12:30 BST on Sunday when victory will clinch the title. Trinidad and Tobago and South Africa have both joined the tournament as guests and their results do not count in the final table. Wales, who beat Trinidad and Tobago 53-46 on Friday, lost 42-72 to South Africa on Saturday evening. Scotland and Northern Ireland, who drew against Wales on Thursday, are also in action, both taking on Trinidad and Tobago.